Warner Bros. has released a 5-minute-long extended look at Aquaman, James Wan's upcoming superhero movie starring Jason Momoa as Arthur Curry. This footage was originally shown at San Diego Comic-Con, but Warner Bros. previously held back on dropping it online. With the release date now just a couple of months away, the studio has settled on New York Comic Con as to best time to continue their marketing push, and give the whole world a fresh look at Aquaman. 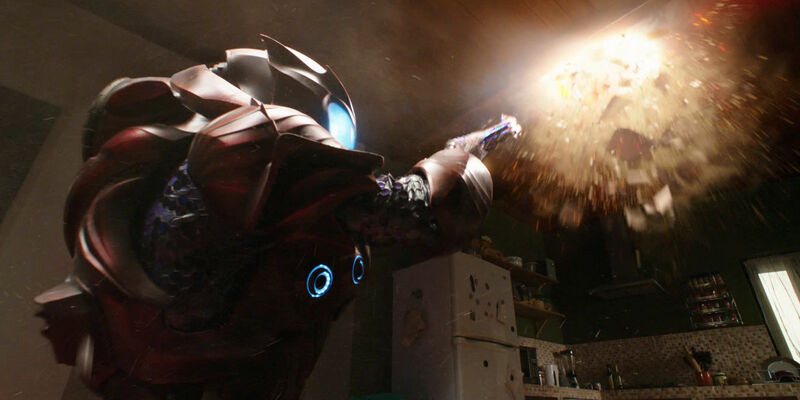 The first trailer was fairly divisive, with the CGI in particular being heavily criticized, but there were reports that the Hall H footage was far better than the trailer. Now we can see that those reports were accurate: this extended look shows off some excellent action sequences, and a lot of strong character moments. Let's break down this latest look at Aquaman in detail, and explore just what it reveals about the movie's plot. James Wan is traditionally associated with the horror genre, and he's wearing his horror influences on his sleeve in this trailer. 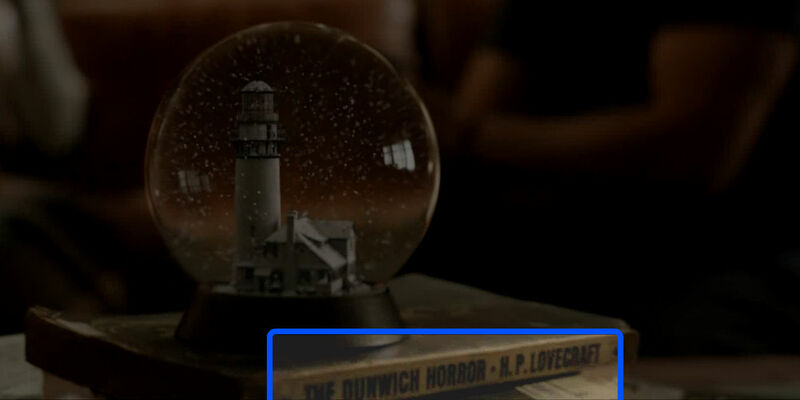 The opening shot features a snow globe of a lighthouse, a fairy tale beginning that at first feels out of place - until you notice what the snow globe is resting upon. It's The Dunwich Horror by H.P. Lovecraft, which tells the story of a human woman who communes with an Outer God to birth a pair of powerful children. Other elements will be reminiscent of Lovecraftian horror as well; when we finally see the Trench, they evoke memories of the Deep Ones in Lovecraft's The Shadow Over Innsmouth. It looks as though Atlanna and Arthur are stood in the background, so it's possible this scene involves her telling Arthur his own origin story. The fairy tale vibe continues with the voice-over, and images of an origin story that initially seems as fantastical as any Disney film. This section stress Arthur Curry's unique position, as a "son of the land, and a son of the seas." As such, Arthur's mother believed he was destined to be the bridge between those who dwell on the surface and those who live in the oceans. It's a destiny that Arthur attempts to reject after Atlantean forces come for his mother. The trailer swiftly moves on to an extended scene in the Sahara Desert, in which Arthur and Mera find the ruins of ancient Atlantis. They're walking through a site that would be a dream to any archaeologist - the remnants of a civilization that flourished 7 million years ago, before humans even walked the earth. 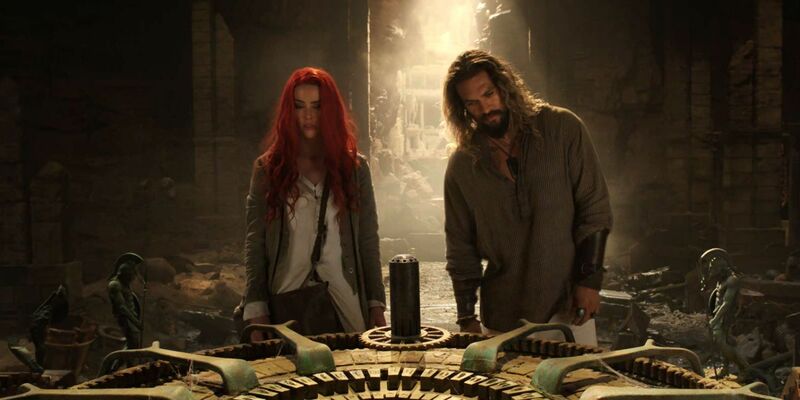 Arthur and Mera have come here in pursuit of an ancient relic of Atlantis: King Atlan's trident, a powerful artifact that would establish Arthur as ruler of Atlantis. The quest for King Atlan's trident is actually the main plot of Aquaman. The film tells the story of how Arthur and Mera locate the trident and use it to unite the seven tribes of Atlantis against Ocean-Master. They're pursued by Ocean-Master and his forces, most notably Black Manta and his group of thugs. We've previously seen photos from this scene, but now we get an in-depth look at how ancient Atlantean technology works - and just how advanced it was. As well as showcasing Atlantean technology, this clip demonstrates the humor that will run through Aquaman. It's fascinating to see Mera use her power in a more subtle way, drawing water from Arthur's forehead, but his unimpressed reaction is sure to get some laughs. 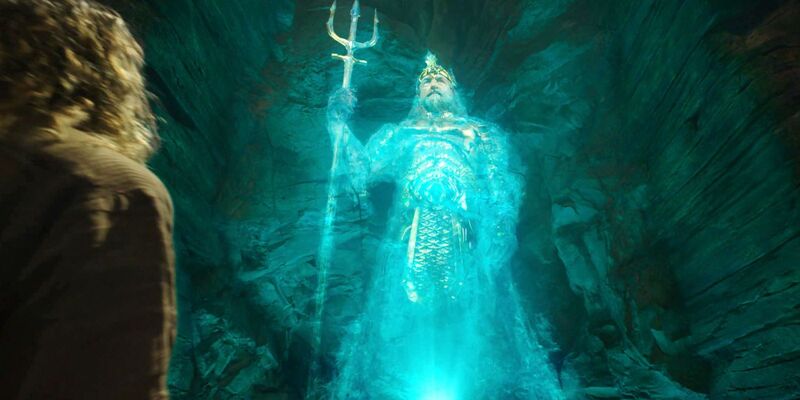 The video gives viewers a first look at King Atlan's trident, in which he declares "resides the power of Atlantis." It's as yet unclear just what this trident is capable of, but certainly it seems to allow extreme mastery of the oceans. One line is particularly interesting: "In the wrong hands, it would bring destruction." That dialogue is accompanied by a scene of ancient Atlantis, with a dazzling white light blasting over the city, so it's possible that the trident itself was used to drive Atlantean civilization beneath the waves. If that's the case, Aquaman will literally wield the power to raise Atlantis - something that's recently happened in the comics. Notice that Atlan hints that the trident can be used to unite both those below and above the waves. Its power may be sufficient to allow Arthur to stand as a king among land-dwelling humans as well as the seven tribes of the sea. We're given some more glimpses of Atlantean technology, which is clearly advanced beyond anything known on the surface. At the same time, though, it's interesting to note that the tech doesn't seem to have developed significantly since the days of King Atlan. 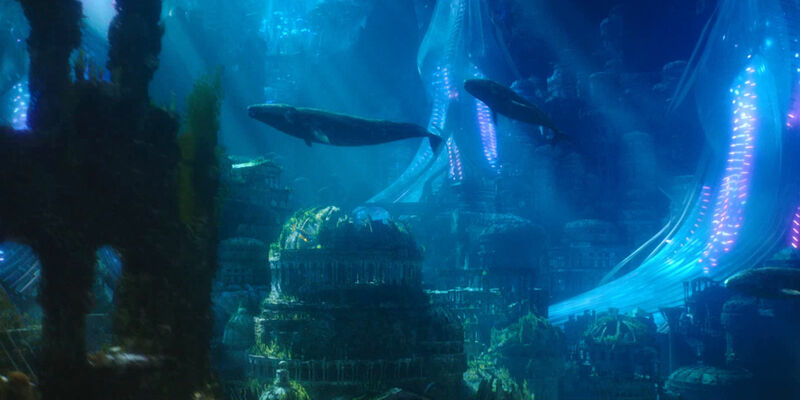 It feels as though Atlantean science was essentially put on hold after the destruction of the ancient city. 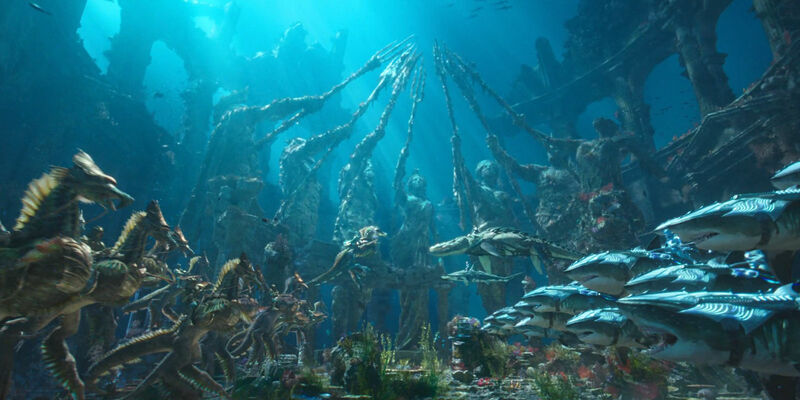 The design of Atlantis is absolutely beautiful, a blend of comic book concepts and the sealife you find around coral reefs. In fact, it really does look as though the city is built into the side of a reef. This may well explain why Atlantis feels threatened by humanity's pollution; rising sea temperatures and the acidification of the oceans are killing off the reefs. It's possible pollution is literally destroying the City of Atlantis. 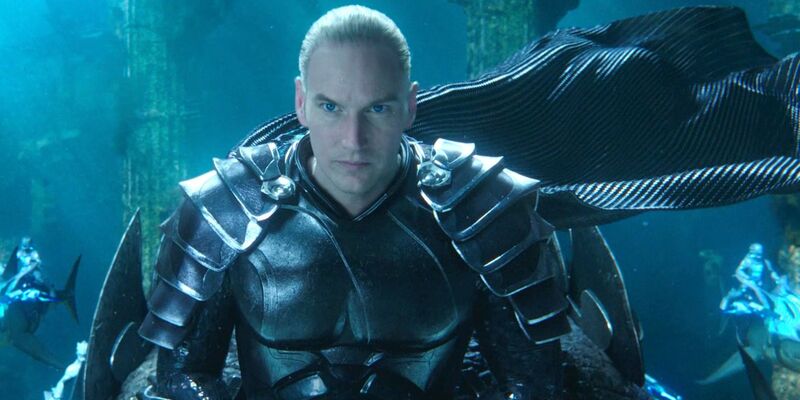 There's another brief shot of the film's main villain, Ocean Master, who is attempting to unite the seven tribes in war against the surface world. He believes that Atlantis has suffered enough because of humanity's careless ways, and that the time has come to put matters right. So far, there's been a lot of focus upon Ocean Master's (comic-book-accurate) helmet, but here we see him take it off to reveal the face of actor Patrick Wilson. Ironically, Ocean Master will himself be responsible for bringing Aquaman into the fight. As shown in both the trailer and this extended video, Orm sends a tsunami against Amnesty Bay in an attempt to kill Arthur Curry. Realizing that his loved ones are in danger, Arthur reluctantly agrees to accompany Mera and embrace his legacy. Ocean Master's goal is to unite the seven tribes under his rule - whether they like it or not. As we see, this leads to war, with the tribes turning against one another. It's fascinating to see how the Atlantean tribes coexist with the natural world, using creatures like sea-horses and sharks for mounts. In this scene, we see Ocean Master attempting to persuade King Nereus to avert the war and take his side. Nereus is ruler of the Xebellians, and in the comics he and Arthur have a somewhat antagonistic relationship. In fact, they're traditionally portrayed as rivals for Mera, and at one point Nereus was betrothed to her. 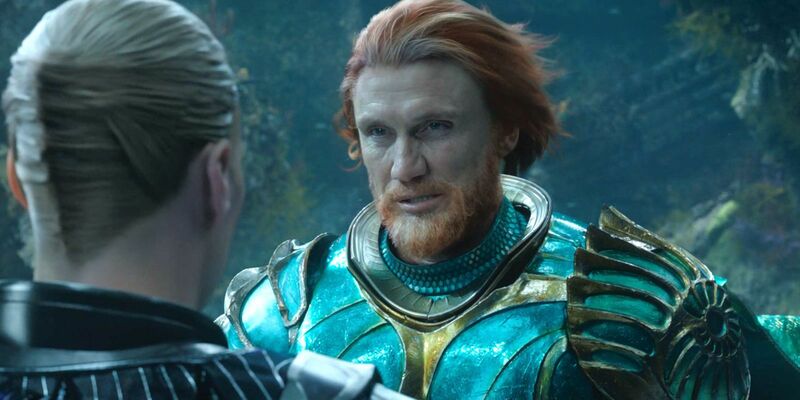 The movie abandons that particular element of DC Comics canon, rewriting Nereus as Mera's father. The nearly 30 year age difference between Lundgren and Amber Heard makes a whole lot more sense this way, though the backstory change will likely upset quite a few fans who prefer comic book accuracy. 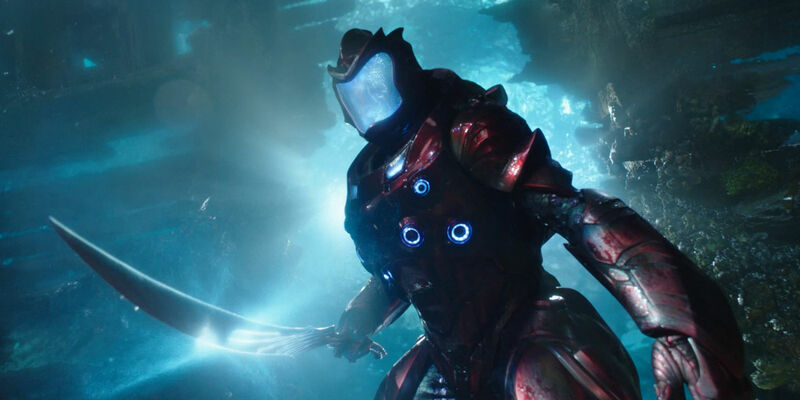 Although Nereus probably won't be Aquaman's biggest fan, director James Wan has confirmed that he won't be a third antagonist. It seems more likely that he's something of a neutral party, with both Ocean Master and Mera attempting to persuade him to take their side. This is another thrilling extended scene, showing Black Manta and his goons pursuing Arthur and Mera. In Aquaman, Black Manta will have a personal vendetta against Arthur, whom he blames for his father's death. He'll join forces with Ocean Master, a villain who looks to be terrifyingly dangerous. Arthur and Mera are forced to flee across the rooftops, with laser beams and heat blasts tearing the masonry around them. This is a very impressive scene, most notable for the effortless ease with which James Wan switches from Arthur to Mera in the long tracking shot. 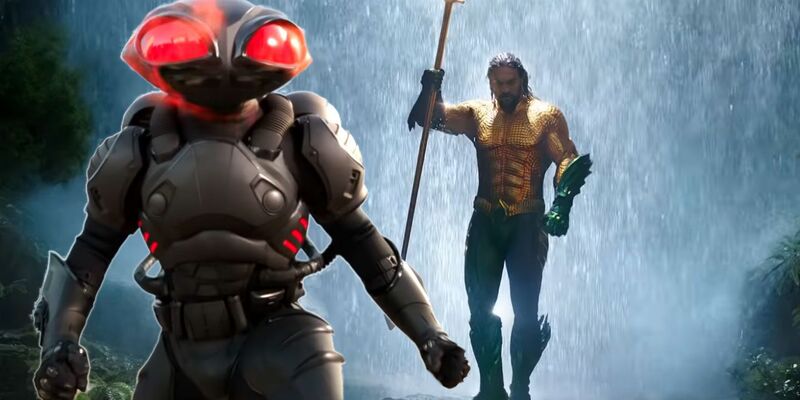 Notice that Black Manta's costume is designed to allow him to be a threat to Aquaman in every way possible; he's equipped for close combat, with extendable blades, but he also has projected energy weapons that can blast Arthur aside. All attention has been focused on Black Manta, but it's interesting to note that the villain isn't alone. It looks as though Ocean Master has also suited up Black Manta's pirates. 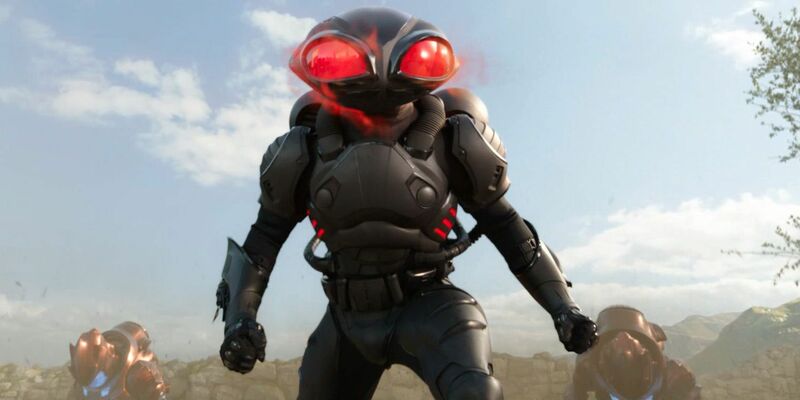 While none of the goons seem as formidable as Black Manta himself, they're still powerful enough to smash their way through walls without any problems. They'll definitely be a challenge for Arthur and Mera. This sequence appeared in the trailer as well, and seems to be one James Wan is particularly proud of; he described it at length during our set visit. 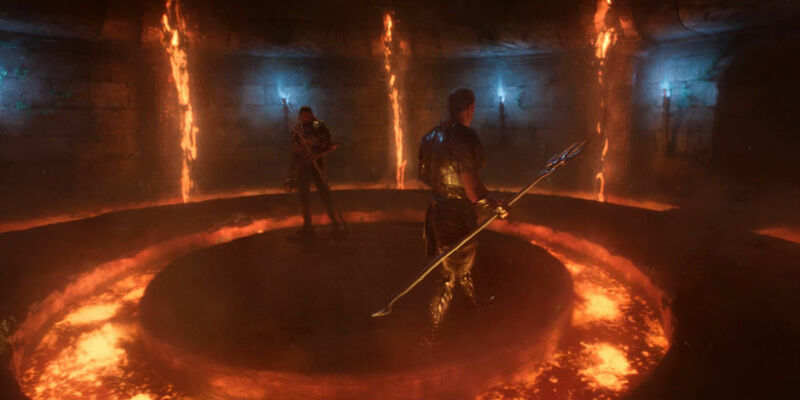 Here, Aquaman and Ocean Master engage in ritual combat for the throne of Atlantis, and idea that will remind many viewers of a similar scene in Black Panther. In this case, the duel takes place in some sort of volcanic collapse pit, presumably part of the Mid-Oceanic Ridge. Although it's quite rare, it is possible for lava to flow like this on the sea-floor. The area Arthur and Orm are battling in would be extremely hostile; it's impossible to guess what temperature the waters would actually be at. That said, in Aquaman, your average Atlantean is almost as powerful as a Kryptonian, so no doubt these conditions wouldn't be too problematic for the combatants. This is a particularly interesting scene, with Aquaman battling Black Manta's agents inside some sort of air bubble. It was created by Mera, and we can presume she's using her powers to keep some humans aboard this ship alive. There's absolutely no context for this scene, so as exciting as it may be, we have no idea how it fits into the larger plot. Page 4: Aquaman Dons His Classic Costume At Last! "I got to be a mermaid. I got to be a Queen. I got to wear a crown. I got to lie on a rock with my hair strewn and blood and I kind of liked it. I'm not a mermaid, I don't have a tail. I have a crown and I have a particular way of looking. I am a Queen." 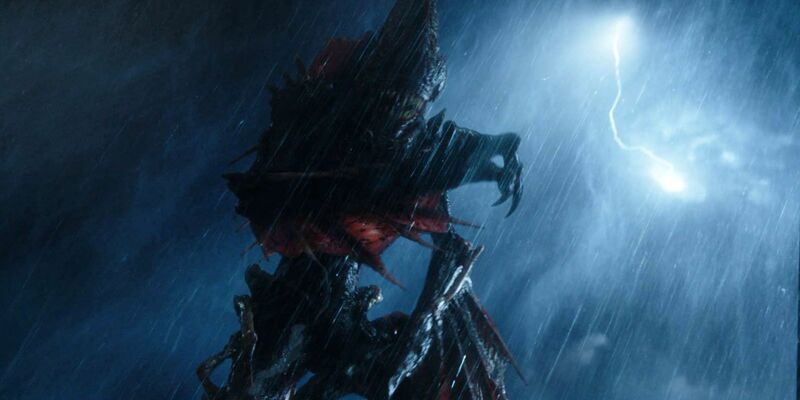 The monstrous creatures known as the Trench appear to be the main enemies in Aquaman, serving as Ocean Master's army. They're a ferocious race whose bodies have uniquely evolved to suit their environment, and can survive at depths that would crush even an Atlantean. Used to living in the dark ocean depths, the Trench can only break through to the surface at night, and it looks as though they're going to launch a terrifying attack upon a fishing vessel. That particular plot thread is lifted straight from Geoff Johns' Aquaman run, and it should give James Wan an opportunity to demonstrate his horror credentials. This extended video finally gives us a real look at the Trench in all their hideous glory. They're truly comic-book-accurate, and they look absolutely ferocious. This white building appears to be the palace of Xebel. 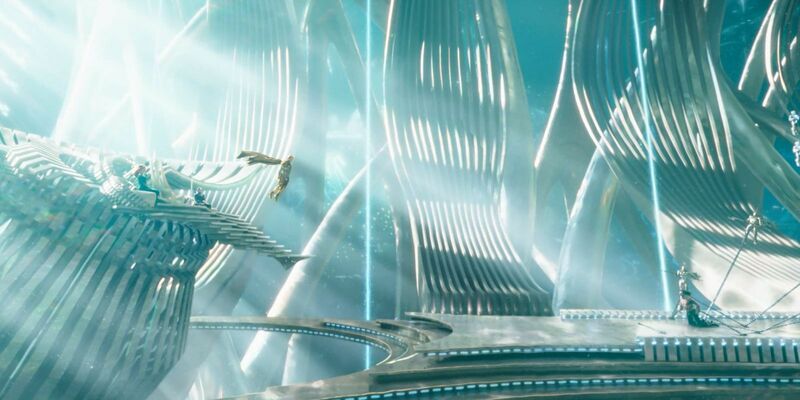 In the first scene, you can clearly see Atlantean technology, and on close examination Mera's hair is visible on the central dais. The second scene, though, is far more revealing. It appears to show Arthur being forcibly brought before King Nereus, who leaves his throne to approach the young upstart. It's certainly appropriate to give viewers a brief look at a throneroom while playing a voice-over from Arthur in which he declares, "I'm not a king." 2. Ocean Master's Ultimate Weapon? This creature is a spectacular addition to Ocean Master's army: a monstrous giant lobster, reminiscent of creatures actually found in the sea depths offshore Japan. 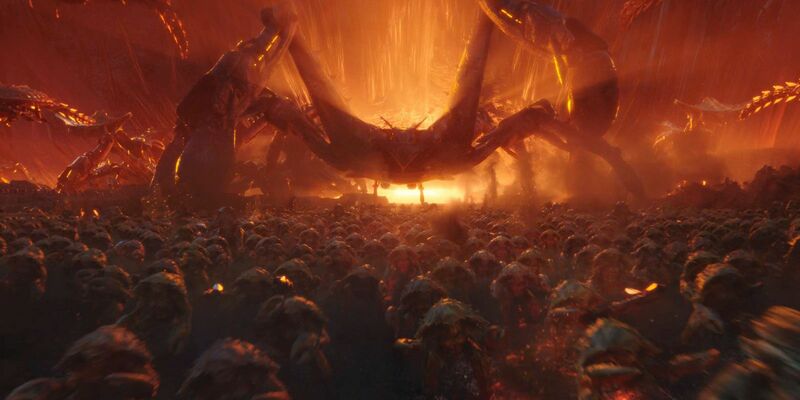 It makes sense for Ocean master to have monsters like this in his army, given that he's allied with the Trench, who dwell inside the ocean trenches. It's clear that the seven tribes will wind up going to war against one another, and with weapons like this, Ocean Master may well have the edge. Let's just hope he doesn't have The Meg on his side as well. The extended look ends by finally letting us see Aquaman in his comic-book-accurate costume, which has so far only been shown in the movie's tie-in merch. This, really, is the highlight of the entire video: the promise that Arthur Curry will embrace the call to be something even "greater than a king." He will become a hero, a true champion of justice who fights for peace between humanity and the tribes of the sea. 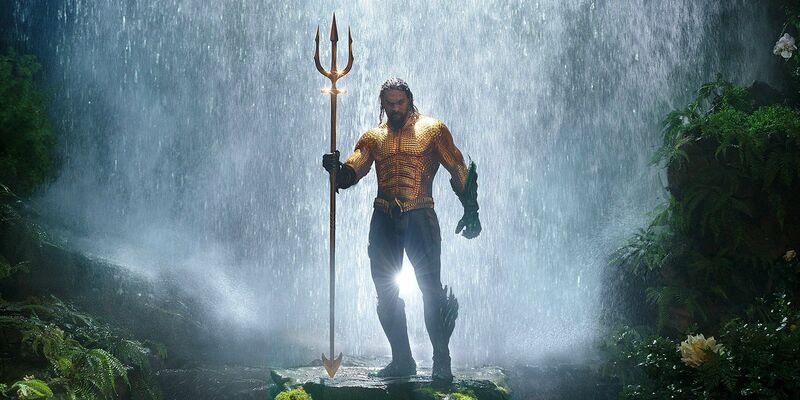 Aquaman's trademark green and orange costume has been redesigned subtly to serve as armor - and notice that he's carrying King Atlan's trident, indicating that this is a shot from the movie's third act (or possibly even the very end). The clip ends with Aquaman striking the trident to the ground, just as Atlan himself did earlier on.